We spent a night in Zaragoza, Spain in August on our way to join our canal barge cruise in the south of France. Zaragoza is the fifth largest city in Spain. 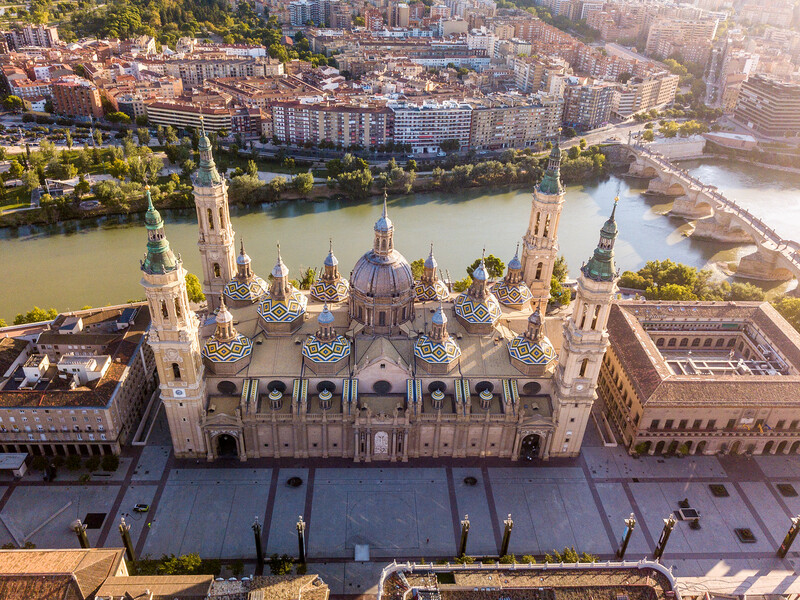 It’s located on the Ebro River in the northeast of Spain, roughly halfway between the cities of Madrid and Barcelona and is the capital of the Aragon region. Whenever we visit a city, we just love to head to the historic heart and explore from there. Nothing is more delightful than strolling through the narrow streets, admiring the old buildings, and people watching from one of the cafes on the main square near the Zaragoza tourism office. 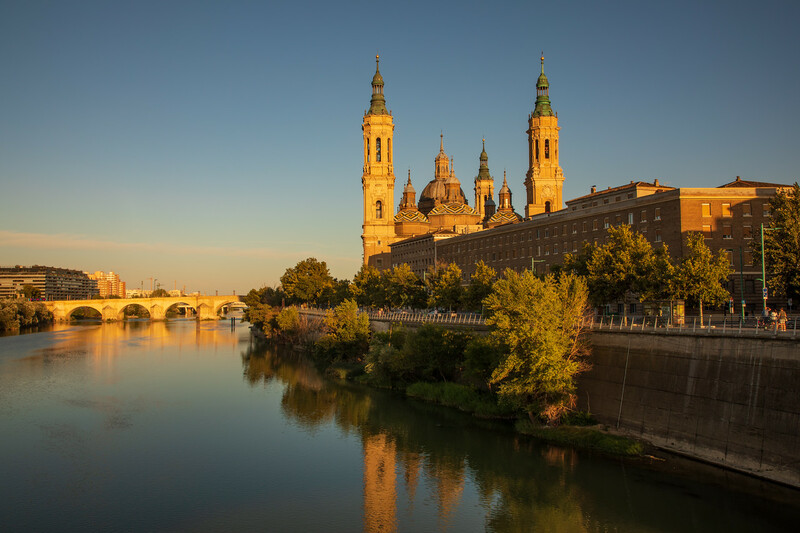 One of Zaragoza’s most famous buildings is Nuestra Señora del Pilar or the Basilica of Our Lady of the Pilar. It’s a renowned pilgrim spot for Christians. Legend says that St James saw a vision of the Virgin Mary here in 40 AD, and was told by her to build a church in that spot by the Ebro River, in her honour. Since then pilgrims come from all over the world have come to Zaragoza to kiss the Pilar. It’s possible, although we didn’t, to go up to the top of the Basilica’s tower for a great view of the city. To climb the tower, there’s an entrance fee of €3 per person. It’s free for children under the age of 9. Apparently, if you travel to Zaragoza during the second week of October, there’s a fun festival dedicated to Our Lady of the Pillar. Maybe worth checking out! Almost next to the Basilica of Our Lady of the Pilar, and located at one end of the Plaza del Pilar is the El Salvador Cathedral. This cathedral has a long history. It was built in the 12th century and is an interesting mix of Romanesque, Gothic, Renaissance, Baroque and Mudejar styles. The Mudejar part of the Spanish cathedral was listed as World Heritage in 2001. From here, you leave the main square and head into the small back streets of the historic centre. It’s quite a charming place to wander around. 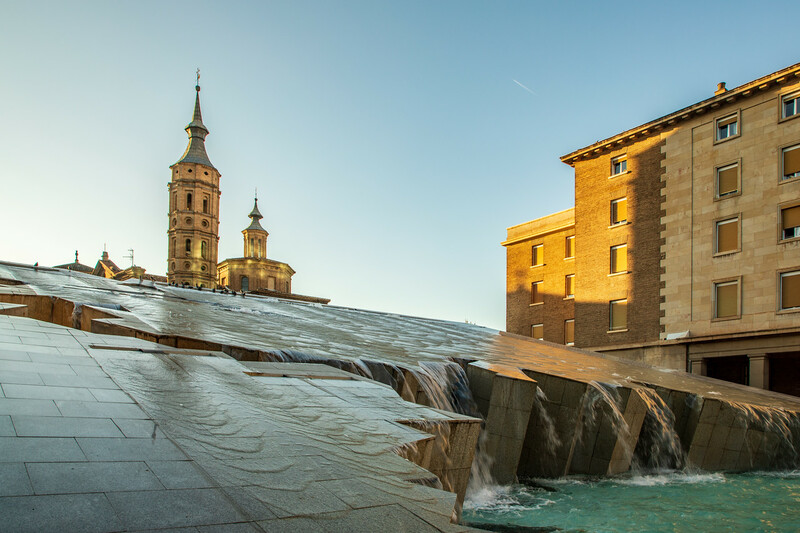 There are many museums in Zaragoza to explore. The Aljafería Palace and the Expo centre that was built in 2008 are also meant to be worth a visit. But we were only there for a short time, and one of our reasons for breaking our journey in Zaragoza is we had heard good reports about the tapas. 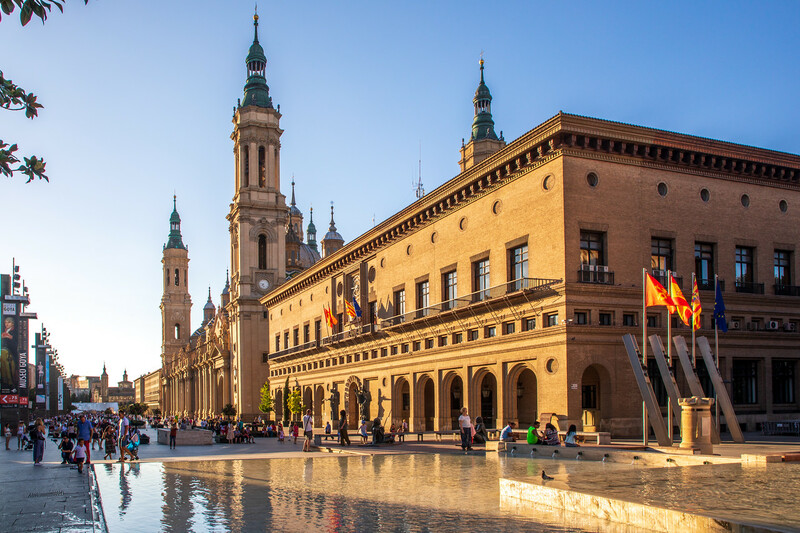 Zaragoza is one of the best places in Spain for enjoying tapas. Oh my, they were some of the best food we have eaten in a very long time. Not since San Sebastián have we found such great tasting tapas. 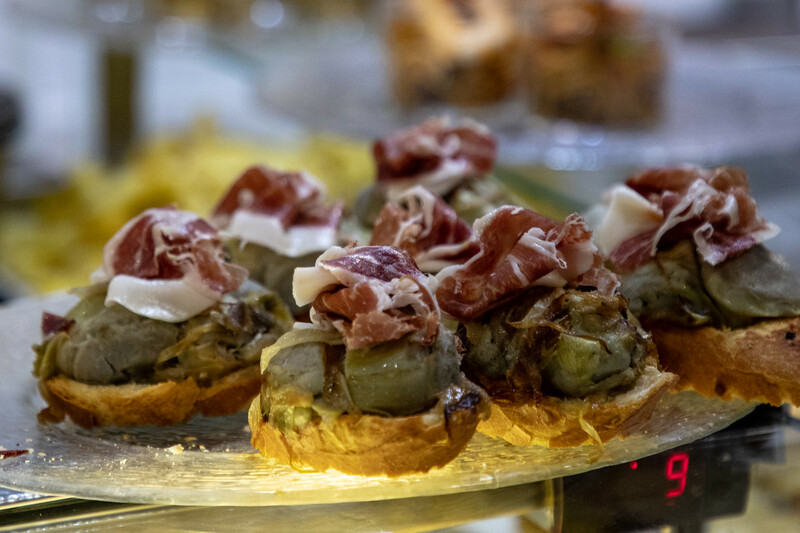 A trip to the city of Zaragoza would not be complete without an evening of moving from tapas bar to tapas bar, enjoying a glass of wine and the many different tapas on offer. Start at the Calle Mayor and keep on exploring. Many of the tapas bars are tucked away off the Calle Mayor in the tiny alleyways and backstreets. Our favourite, however, was the Meli Melo, Calle Mayor 45. We stayed in an odd little place called The Bridge that we had booked through Booking.com. It had good reviews and was only €50 for a double room with private shower but shared toilet. Very clean, and in a fabulous location. Just a few minutes walk to the major sites and tapas bars. There are hotels, hostels and guesthouses in Zaragoza to suit all budgets and tastes. We drove as part of our road trip from our home in Portugal to the South of France to cruise the Canal du Midi. If you don’t have your own transport, there are regular buses and trains from Madrid or Barcelona to Zaragoza. Next stop on our way to the Canal du Midi, Andorra! Considering it’s the fifth largest city in Spain, I’ve never heard of Zaragoza before, but you’ve definitely just added it to my list! Beautiful! I also had not heard of Zaragoza, but I am glad now that I have. Love the pics you included as well. I feel like I have been there. Zaragoza seems to be a lovely destination. The fact that it is soaked in history makes us want to visit it soon! That Tapas looks soooo yummy! Happy that we picked a bit of Spanish and can’t wait to visit the country soon!